Eggs are always considered to be a good source of protein, but people refrain to have them with a fear that it would contribute to their cholesterol levels. But little do people know that only the egg yolk contributes to cholesterol in the body. 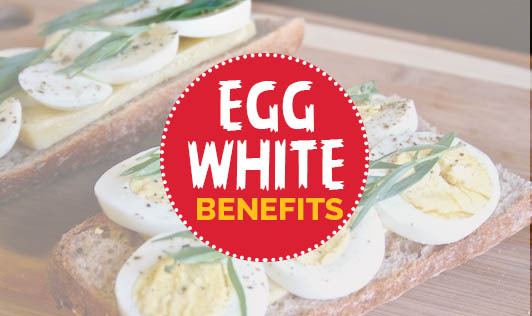 • One egg white contains 9 essential amino acids and 6gm of high quality proteins. • Egg whites prevent muscular degeneration due to carotenoid present in them. • Lutein and zeaxanthin present in eggs lowers the risk of developing cataract. • A study conducted by Harvard school of Public health concludes that the consumption of egg white prevents blood clots, heart attacks and stroke. • It is the only food that contains naturally occurring vitamin-D.
• Studies prove that regular consumption of egg whites reduces the risk of breast cancer. • One egg white contains 17 calories, 0.1gram fat, 0% cholesterol, 0.2 g carbohydrates, 3.6g proteins, 2.3mg calcium. • Egg whites are beneficial for skin care as they help reduce acne and have bleaching effect. It helps balancing oil in oily skin. • It helps delay the occurrence of wrinkles on the skin and protects from sun burn.